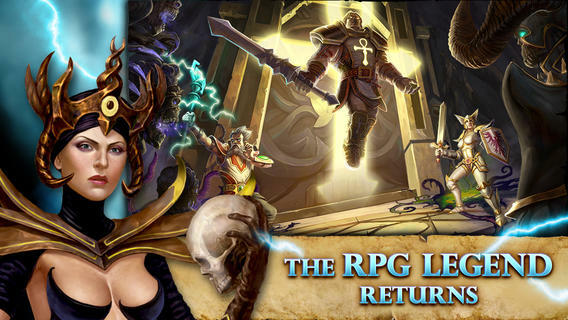 Electronic Arts latest offering for iOS devices is Ultima Forever : Quest for the Avatar. The game is now available for download for free but there are in-App purchases which will get you gold and accessories for the game. Ultima Forever is based on a similar game released in 1985 called Ultima IV. The story in the game takes place exactly 21 years after the Ultima IV. In the game you are sent on a mission by the Lady British, daughter of Lord British. The mission is to help out Lady British in wiping out the Black Weep plague. This role playing game involves you taking a role in a small group of 3 to 4 characters who wander the land of Britannia. You have to fly hot air balloons over mountains and sail the seas. In between you get to fight the sea monsters and survive the tempests and the storms to make it to the pole. The pole being collecting eight VIRTUES. The game play also lets you mentor the other less experienced players of the ways of the game or vice versa. The game is a part of The Age of Enlightenment of the Ultima Series. If you have been following it, you will know that the Ultima takes place in three major parts : Ultima I to III - The Age of Darkness, Ultima IV to VI - The Age of Enlightenment and Ultima VII to IX - The Age of Armageddon. If you are interested in this beautiful game and own a iOS device, you can download the game from Apple Store.